Daniel Buren's Photo Souvenir: Optical Fiber, White and Blue Arch, Situated Work, 2012. Courtesy the artist and Bortolami, New York. For Tony Karman, the point is to get the art world to circle September 22 to 25 on their calendars. That’s when Expo Chicago 2016 happens, now in its fifth year under Karman, the art fair’s founder, president and director. This year the show continues its expansion with 145 galleries from 22 countries and 53 cities, ensuring that modern and contemporary art collectors and admirers—about 35,000 of them—will find something to like. Hank Willis Thomas’s Jim Ricks and Ryan Alexiev In Search of the Truth (Truth Booth), 2011. Courtesy of Project&. Last year’s sales tended to focus on mid-priced works by mid-career artists, with JJ PEET nearly selling out his entire display and Kehinde Wiley selling two oil paintings for $125,000 each. Returning this year, Chicago-based Rhona Hoffman Gallery earned more than $200,000 last year with works by artists such as Sol LeWitt and Natalie Frank. While this year’s exhibitors hail from points all over, the buyers tend to be local. Christopher D’Amelio of David Zwirner Gallery in New York was on the selection committee and is attending the fair with works by Josef Albers and Sigmar Polke, the estates of whom have recently come under the gallery’s control. Karman recognizes the one thing his fair can give gallerists—that the crowded art-fair market cannot—is access to Midwestern buyers and institutions beyond Chicago city limits. “We have a strategic initiative to make sure we are really turning out the greater Midwest for our galleries. And there’s a significant amount of buying power and curatorial institutional heft from many institutions in the greater Midwest area,” he says. Susan Hefuna’s Another Place, 2014. 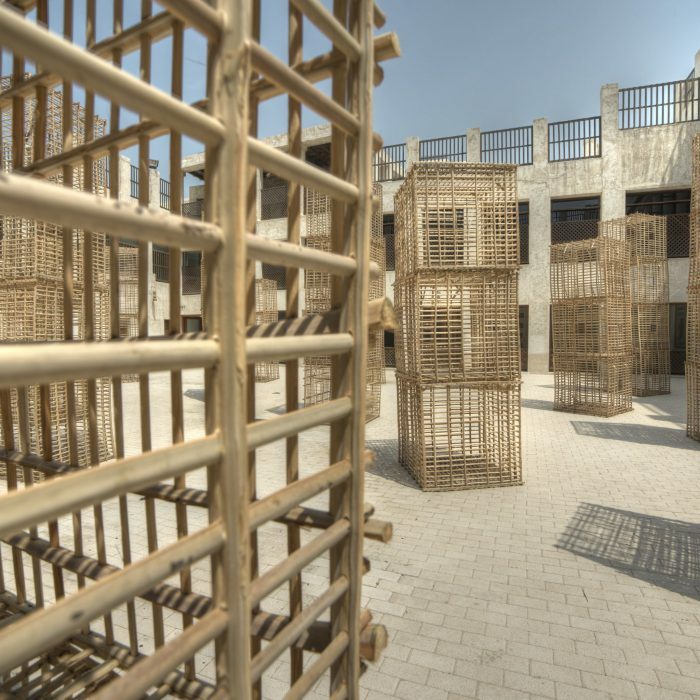 Installation View, Sharjah Art Foundation, UAE. Courtesy of Rhona Hoffman Gallery. Back in the 1980s, Art Chicago was the North American answer to Art Basel, growing into the most important fair on the continent until a combination of factors, including the recession, brought it to a close in 2012. Karman saw an opening and launched Expo Chicago that same year. Five years later he’s still going strong, with this year’s edition featuring a keynote discussion between artist Joseph Grigely and renowned curator and critic Hans-Ulrich Obrist, as well as panel discussions like the one featuring Palais de Tokyo curator Daria de Beauvais, who is overseeing Expo Video with works by artists like Pierre Bismuth, Jesper Just and Mary Reid Kelley. New this year is OVERRIDE, a citywide initiative where about a dozen artists will have their works displayed on roughly 30 electronic billboards around Chicago. Returning for the fifth time is IN/SITU, a popular segment celebrating site-specific works by artists represented by the attending galleries.